The Flag Fundamentals Training Program contains 20 short videos on a single DVD covering 16 Simple Tips that build upon each other to help you strategically school your horse on the flag. 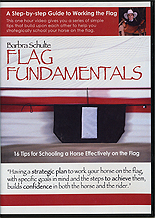 How to organize your work on the flag in a systematic way as an effective schooling tool to work your horse on a cow (or just develop a better turn-around). How to build your horseâ€™s stop, turn-around and then traveling with a flag or a cow (or just traveling in straight lines for all horses). The â€œwhysâ€� behind each tip so you will be able to apply it to your own horse and situation. Why and how to work the flag in a creative and versatile way to solve challenges with your horse. Visual examples of how to do each tip. Home exercises for the tips so you will have ways to apply the ideas to your own situation. Common challenges you might encounter trying to execute some of the tips and how to solve them.